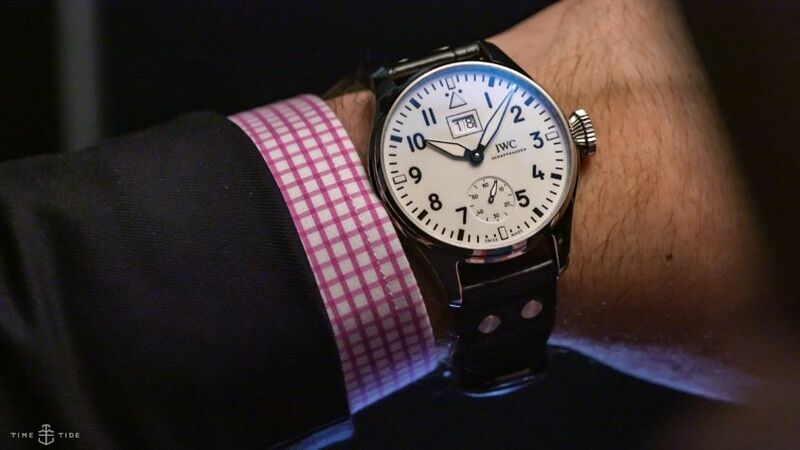 It’s IWC’s 150th birthday this year and to celebrate they’ve released 27 watches across five different collections – Portugieser, Portofino, Pilot’s, Da Vinci and Pallweber – that represent some pretty exciting firsts and evolutions for the brand. We’ve chosen one watch from each collection to highlight, as well as two from the Pilot’s Collection, because, well, Pilot’s watches. 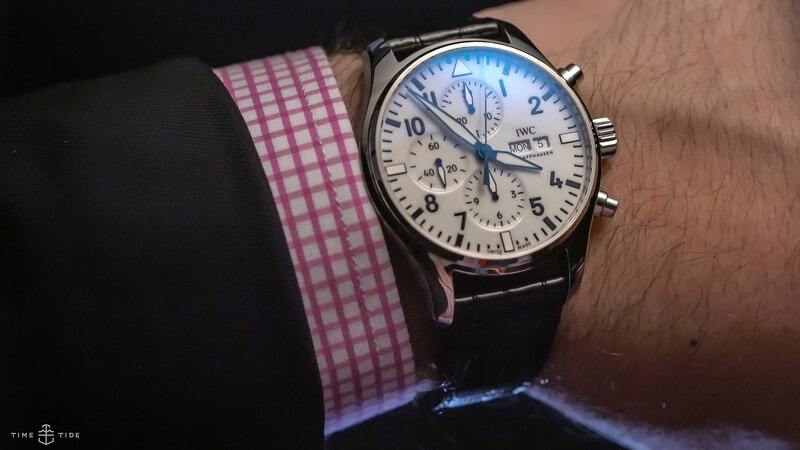 This is the first Big Pilot’s Watch from IWC with a big date display. How many of this version are available? Two limited-edition models are available, each restricted to 100 watches, one with a blue lacquer dial and one with a white lacquer dial. Both are in stainless steel, the blue dial with rhodium-plated hands and the white with blued hands. The lacquer on the dial is applied in 12 layers, with the last being hand-finished. It gives a glossy depth to the dial that’s a dramatic change up from the standard BP and the Le Petit Prince version. The dial. White lacquer. Arctic. Glossy. Glorious. Like on all models in the Jubilee collection, pricing is less than 5% more than on current like models. The moon phase module has been added to the Calibre 59000. It will deviate from the actual cycle of the moon by just 1 day every 122 years. This is the only gold watch in the Jubilee collection with a blue dial. The hands, as well as the moon and stars in the moon phase display, have been gold-plated to match. 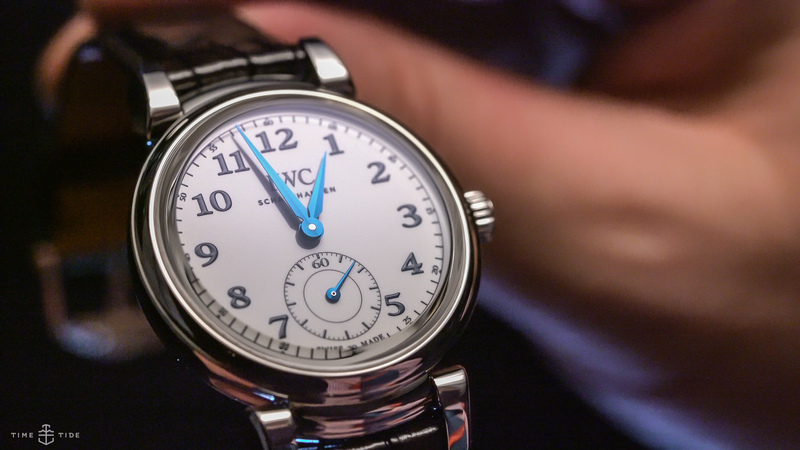 This is the first time a digital hours and minutes display is being offered by IWC in a wristwatch. Behind the blue lacquer dial is the new Calibre 94200 movement which took five years of work to develop. 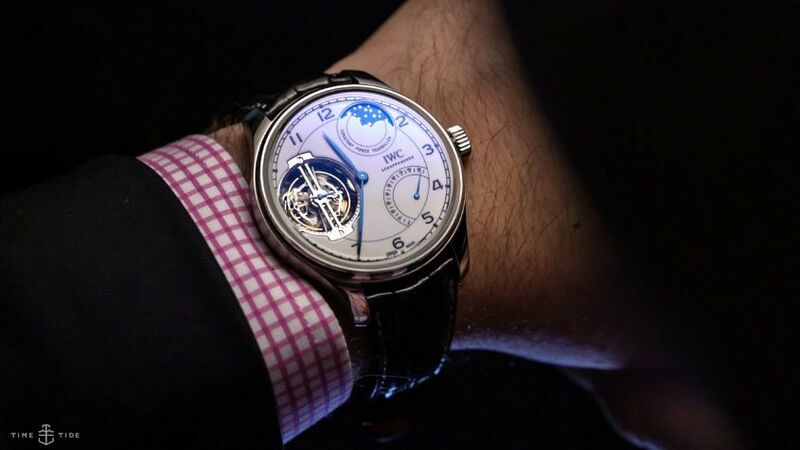 It comprises of two barrels; one automatic and one hand wound, as well as two gear trains – one for the single minute disc, the other handles the other display discs. It has a 60-hour power reserve. 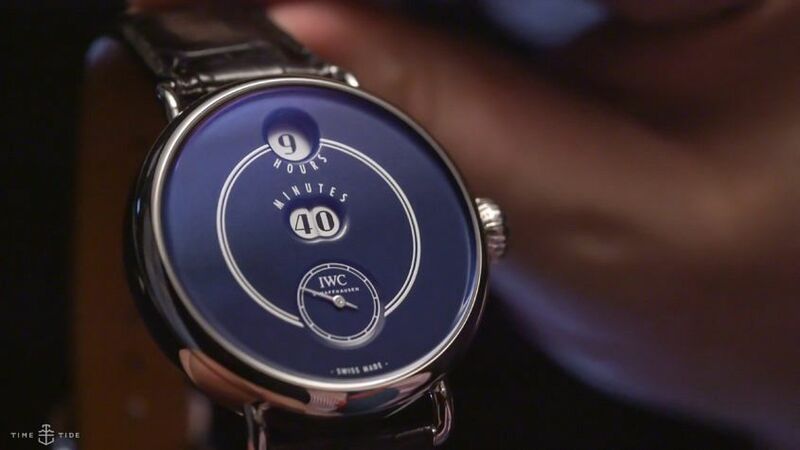 The Tribute to Pallweber harks back to when IWC started using this form of time display in pocket watches in 1884. 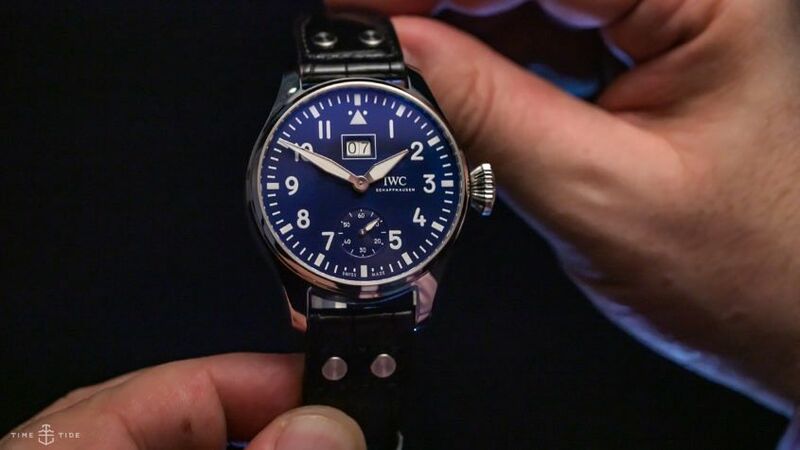 The newly developed automatic IWC-manufactured 82200 calibre. Movement components in this watch that are subject to particularly hard use, such as the pawls or the cam, are made of virtually wear-proof ceramic. The skeletonized rotor features circular graining and Geneva stripes. 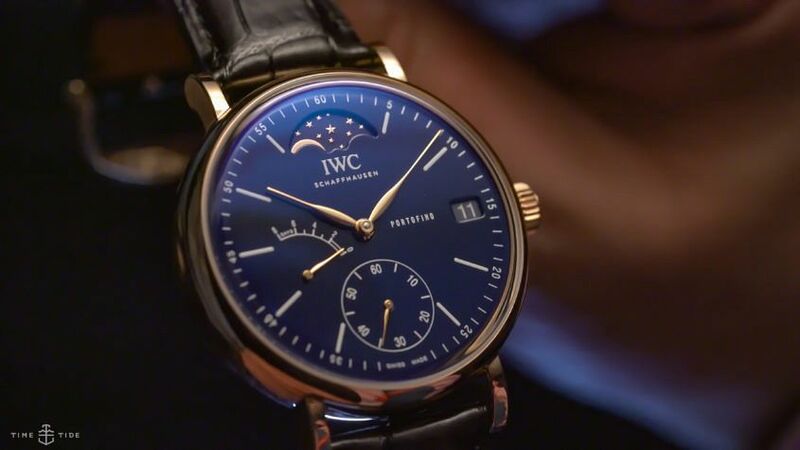 This is a new movement – the IWC-manufactured hand-wound 94805 calibre with a power reserve of 96 hours. This model combines a constant-force tourbillon with a simple moon phase display that only needs to be adjusted by 1 day after 577.5 years.